improve understanding and social awareness of why people behave differently and thus reduce the incidence of unwitting and unintentional discriminatory behaviour in the workplace. What sort of discrimination is unlawful? What else does a public body have to do? 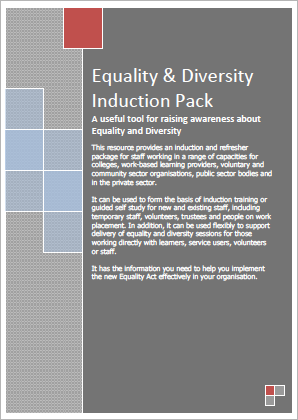 This Equality and Diversity pack provides teaching staff with advice, guidance and session plans that will help them to explore the key issues with learners, explain complex legislation simply and clearly and act on the organisation’s equality duty by promoting the benefits of embracing equality and diversity. Notes for facilitators and answer sheets that provide additional and background information to inform the activities and enhance the learners’ learning experience. 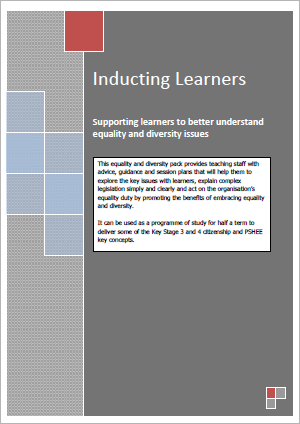 The activities in this pack can be used to support the following curriculum areas, either in isolation or as a planned programme of equality and diversity learning. 1. What do we mean by equality and diversity?